Book I of the Aeneid contains a masterfully created scene that takes the reader through a surrealistic door. Aeneas comes to a temple in Carthage dedicated to Juno, and the reader suddenly becomes an art viewer of paintings on the walls of the unfinished temple. The surrealism lies in the subject matter being viewed by now both reader and fictional participant – a depiction of an event to which the protagonist is intimately connected. Virgil here uses the ekphrastic rhetorical device. Ekphrasis is the use of an art medium to describe the essence of another. The immediate medium in which the scene in question occurs is obviously the Aeneid itself, and the medium described is a mural on the wall of the temple depicting scenes from the Trojan War. Carthage being Juno’s beloved city, the scene would of necessity be devised so as to please her. She would doubtless take much pleasure in the unabashed cruelty displayed by Achilles as he drags Hektor around the walls of the city of Troy. Triumph alone would be but a tease to the taste buds. This horrific treatment would allow Juno to enjoy it as the nectar due a goddess. Aeneas re-lives the suffering of his lost Troy in the viewing, and in the description the reader is taken on a journey of a much deeper association with him. Two objectives are at once accomplished. 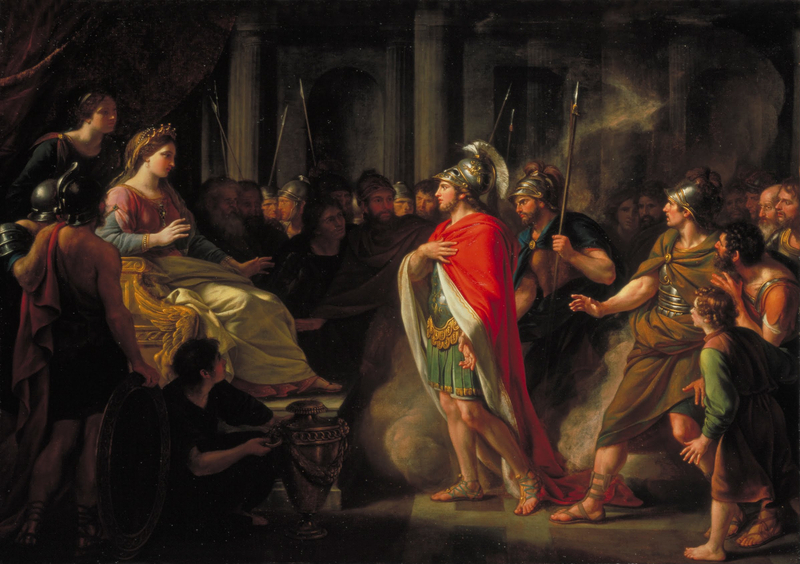 First, the reader establishes an empathetic connection with Aeneas resulting from his emotional response to what he sees. More important is the understanding this connection fosters. The motivation that continually impels Aeneas forward on his journey becomes clear. Empathy establishes near unity as in one fell swoop the reader becomes the viewer as the viewer becomes the viewed. It is important to emphasize the word “empathy” in this context. Sympathy would imply a feeling of sorrow for Aeneas. Empathy establishes that feeling in a much more personalized way as this sorrow turns inward upon the reader and is instead felt with Aeneas as opposed to an detached and external emotional projection. The unity developed between the reader and the suffering of Aeneas vis-á-vis the fall of Troy in this ekphrasis, which suffering continues as he later leaves Dido at Jupiter’s command, harkens to what the reader (though not yet Aeneas himself) knows will be the victorious result of his journey as prophesied by Jupiter earlier in Book I to Venus. With that prophecy in mind, the reader is able to find solace in the deliverance to come from the suffering depicted on the wall. Ekphrasis as a literary tool is intended to speak to a larger message of the text. Virgil uses it with a narrowly targeted purpose – to provide a motive for the voyage, establish an objective, and prophetically foreshadow success. Proverbially speaking, Aeneas may have lost a battle but would ultimately win the war. Before being taken with Aeneas to the temple, the reader is provided with the foundation upon which to build hope in the face of the scene to come in the temple. Jupiter says to Venus, “Don’t be afraid, Cytherea, your child’s fate remains unaltered…” Aeneas has suffered, and his suffering will only intensify. Juno will conspire against him. He will be reminded, as at the temple, of previous defeat and made to feel as though his journey is hopeless. But the lack of mystery in Classic tragedy allows the reader, having now been told in this scene how the story will end, to know better and to understand the value and purpose of each trial along the way. From the ashes of Troy, in spite of the best efforts of Juno, will rise perhaps the greatest empire the world has ever known in Rome. Jupiter’s prophecy will be fulfilled, and the demise of Troy (with which the reader is empathetically connected as an injustice through Virgil’s use of ekphrasis) will in large measure be avenged as the hero wins the day. The rest is, truly, history. This entry was posted in Art History, History, Literature. Bookmark the permalink.